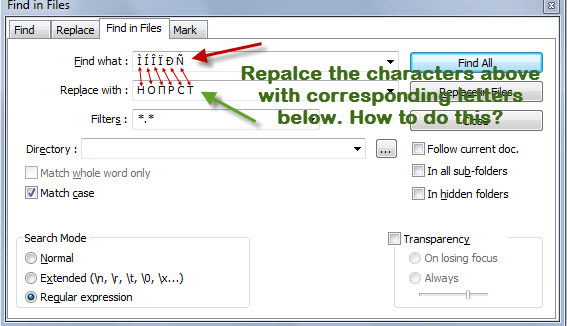 How to find and replace in Notepad++ multiple different characters to corresponding letters at once throughout the text? For example, I have 32 characters that I want to replace. So I have the character like “À”, and I want to replace it with the letter “A”. Next, I have the character like “Æ” and I want to replace it with the letter “Ж” and so on. Generally, I have 32 such characters and each time I need to do the same operation. Is any way to do this at once? Sometimes I have used wReplace from sharktime.com. It works pretty well. You install it and then can indicate as many characters to change as you want to. I know it isn't a plugin style solution, but it works. Hope this helps! This previous question provides an answer. Short version is, within Notepad++ with no plugins, it's not possible due to the way Find and Replace works. I'd look at using sed or similar. Even with Notepad++ 6's new RegEx engine that supports PCRE (source), there's no sane (i.e., with linear complexity) and reliable (i.e., guaranteed to work) approach that will allow you do achieve this in a single Find & Replace, let alone a single Find in Files. This transforms fooÌbar into foo``Ì`ÌH`ÍO`ÎΠ`ÏP`ÐC`ÑT``bar, for example. This transforms foo``Ì`ÌH`ÍO`ÎΠ`ÏP`ÐC`ÑT``bar into H, for example. Note that you need to upgrade to Notepad++ 6.0 or higher for this. While the regular expression itself should also work with the old RegEx engine, there's a bug messes up multibyte characters in general. The character set ([ÌÍÎÏÐÑ]) matches any of those five characters. The parentheses turn this into the first subexpression (see next item). \1 symbolizes the match of the first subexpression, i.e., the character we want to replace. All other characters are treated literally. The choice of ` as the delimiter is arbitrary. You can use any other character you want. (.) matches the first character after ``. The parentheses turn this into the first subexpression. .*? matches as few characters as possible. `\1 symbolizes ` followed by the match of the first subexpression, i.e., the character we want to replace. (.) matches the first character after the character we want to replace. By our design, this is its replacement character. The parentheses turn this into the second subexpression.
.*?`` matches as few characters as possible until the final `` is encountered. How replace many words with other many words in Notepad++? How can I find & replace a single word to multiple different words?